My craziest day of the year is here! 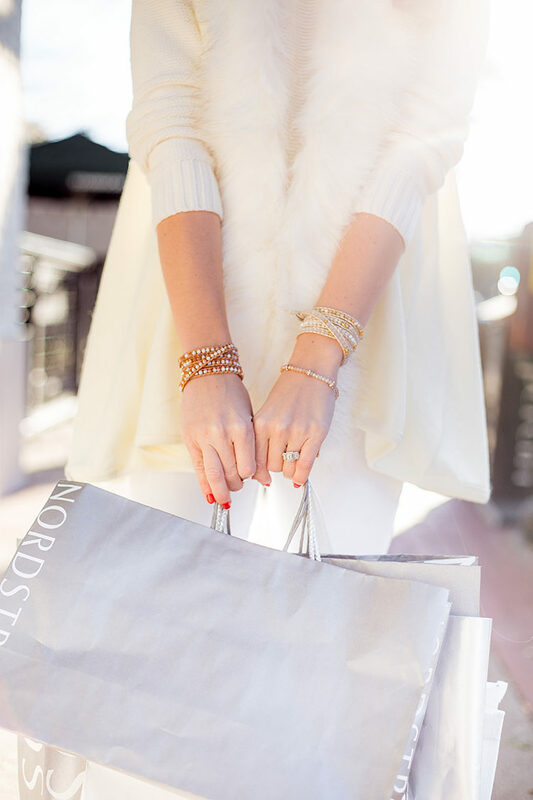 You know the one… the day that you push and push all of your last-minute Christmas errands to. The traffic is insane, the stores are packed to the brim, but something about the hustle and bustle of this day puts me in the Christmas spirit like nothing else! I got an early start this morning and made a rare point to dress up for the occasion. 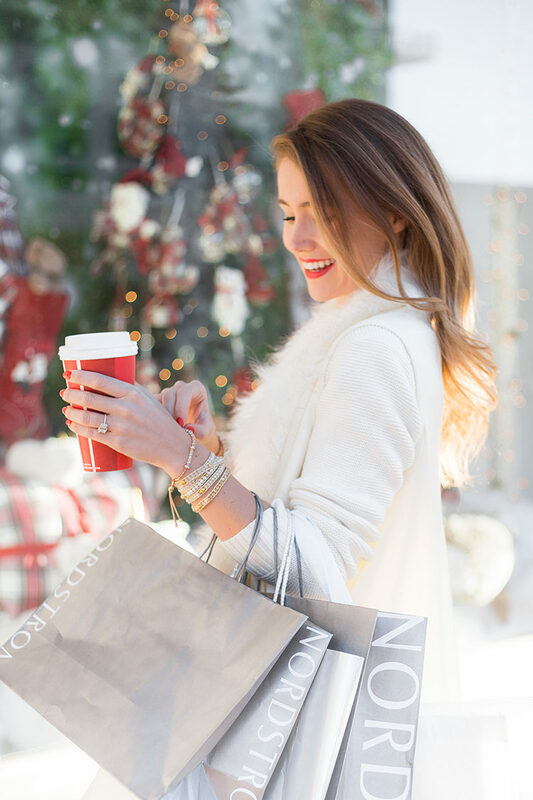 I’m usually in workout clothes when I’m running around town, but there’s something about putting on faux fur, red lipstick and my new Victoria Emerson wrap bracelets that make me extra merry when it comes to running Christmas errands. If you haven’t heard of Victoria Emerson, you’re in luck! Today, I’m so excited to be partnering with the line to introduce a few of my favorite pieces with you. I have a feeling you’re going to fall in love with them, too! When it comes to accessories, I’m very picky. (And that’s an understatement.) If a bracelet isn’t elegant, versatile and lovely all at once, I simply won’t wear it. That’s why when I saw my sister sporting a wrap bracelet, I immediately fell in love. It didn’t take long for me to decide that I had to get one (or two!) for myself. 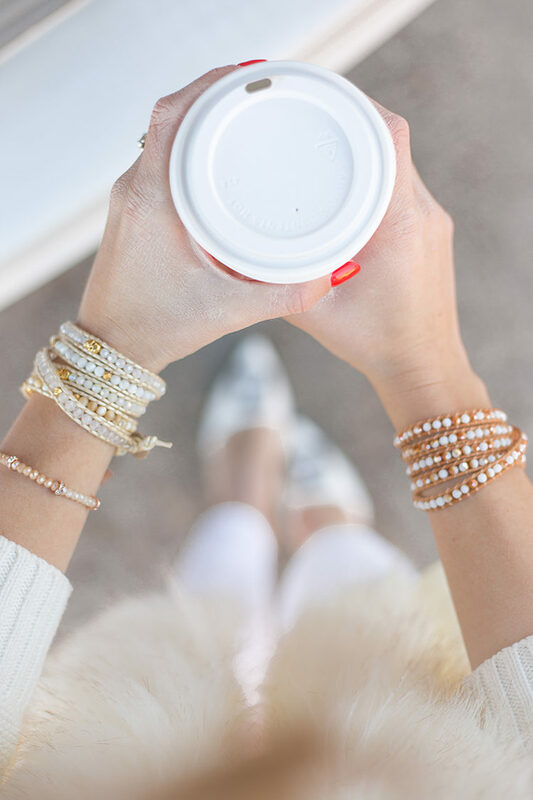 After combing through all of the gorgeous color options on the Victoria Emerson website, I settled on this white and gold wrap, this tan and white wrap and this delicate crystal bracelet for a set I can easily mix and match, as well as dress up or down. Because the price point is so accessible ($30-$40 range) I was also able to grab a few as presents for a few of my friends. I just love the subtle sparkle they give any ensemble and have been getting compliments on them all day. 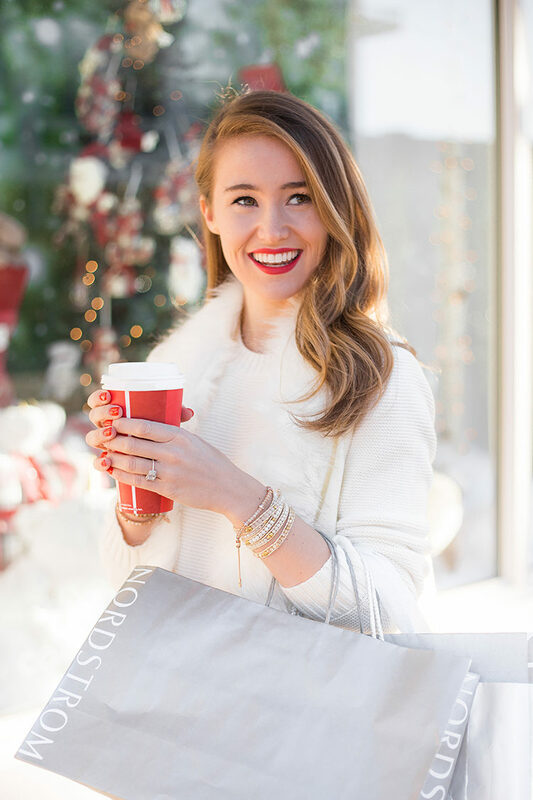 Talk about making things merry and bright! :) You’ll find the whole line here! Now, I thought it would be fun to share a few of the stops I’ll be making today. 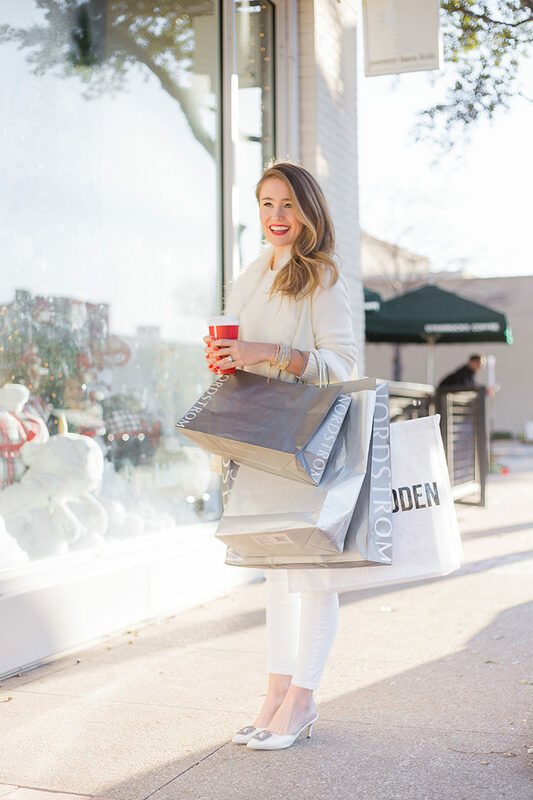 If you’re in Dallas, I’d love to know a few of your favorite Christmas stops as well! ST. BERNARD’S SPORTS // This is, without fail, where I always find gifts for my dad! I get into trouble there way too easily, though, as they also have an amazing women’s department. You’ve been warned! NEKTER // My favorite stop for lunch on a busy day like today? Nektar! You’ll find me with an Acaii Banana Berry Bowl. Yum! THE IMPECCABLE PIG // Y’all know my love for the pig. Might have to grab myself a little something! NORTHPARK MALL // As much as I try to avoid it, I know I’ll be swinging by Northpark today. It’s my favorite mall to shop at in Dallas, and is right around the corner from me! STEIN’S // For a mid-afternoon shopping treat, I’m planning on running by one of my favorite bakeries. We’ve been chowing down on their gingerbread men since I was a little girl! DEAR HANNAH // This boutique is one of my sister and I’s favorites in Dallas. I still want to get my sister one more thing, so I’ll be headed here to see if I can find something! OISHII // For dinner, I’m dying to get a table at my favorite sushi restaurant in Dallas. My parents and I are planning on an early dinner so we can go see Christmas lights after! CHRISTMAS LIGHTS // After dinner, we’ll head over to Highland Park Village to grab a Starbucks, see the gorgeous lights, and then drive around the neighborhood to see some incredibly-decorated homes. We usually take my dad’s convertible and bundle up with the top down. There’s no Christmas tradition I love more! Wishing everyone a Merry Christmas! Can’t believe Christmas Eve is MONDAY! Thank you, Victoria Emerson, for sponsoring this post. Love the shoes! What brand are they? You look absolutely gorgeous in that all white outfit. Would love to know where that sweater is from!